inkyloulou Designs: Some happiness in an otherwise horrible week. Just a very quick post to tell you about my burst of happiness amid my horrible week. Without saying too much I have finally filed for divorce this week- and it's brought up a lot of grief and sadness. 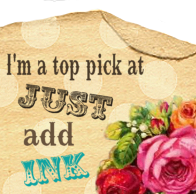 Anywhhhoooo- what better to cheer me up than my card getting picked in the Just-Add-Ink Top 5 this week. Has definitely put a smile on my face!!! Oh Louise, I'm sorry to hear this news, but I am so happy that your card was chosen - it's gorgeous, so no surprise really!! !